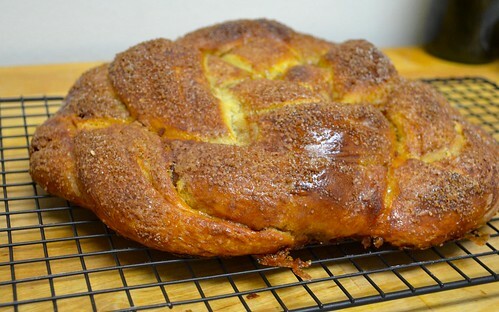 Okay, I've been getting a little gutsy with yeast-risen doughs these days. I don't know what it is, but I seem to be on a supreme bout of serious luck, which I am taking full advantage of until the 100% humidity of summer sets in. 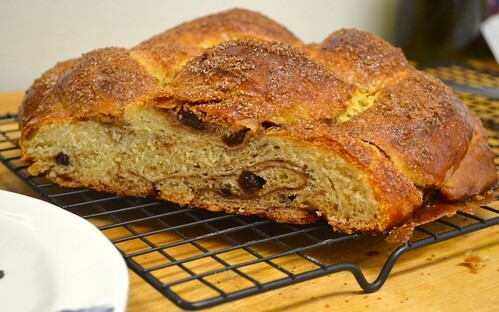 So I've got about 8 more weeks to do some serious bread-baking, starting with another (and more classic) take on challah: cinnamon raisin. Whisk your yeast packet and 1 tablespoon of honey into a warm (but not hot) 2/3 cup of water. Let it stand for a few minutes or until the yeast starts to look foamy. In a large bowl in a stand mixer, whisk together your remaining honey, olive oil and 2 eggs. When your yeast mixture is properly foamed (about 5-7 minutes), add that and continue to whisk. Next, add your salt and flour (1 cup at a time) and about halfway through adding your flour, switch to your dough hook attachment. Once you've added all four cups, allow to run on a medium speed for 5-8 minutes, or until the dough starts to come fully together. 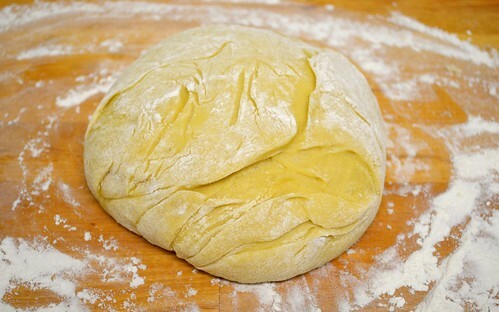 Transfer your dough to a large, well-oiled bowl, cover tightly with plastic wrap and set aside to rise for one hour. (Remember to try my warm oven trick to ensure getting the perfect rise). 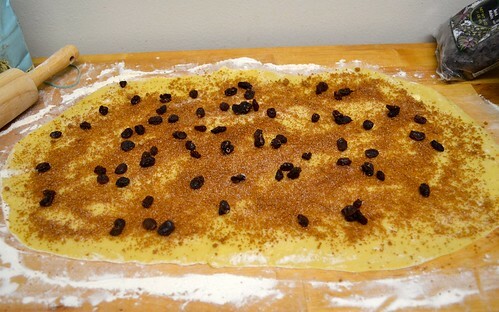 Meanwhile, though this should hardly take an hour, whisk together your two sugars and cinnamon in a small bowl. Set aside to reserve for the glorious part of this bread baking adventure. 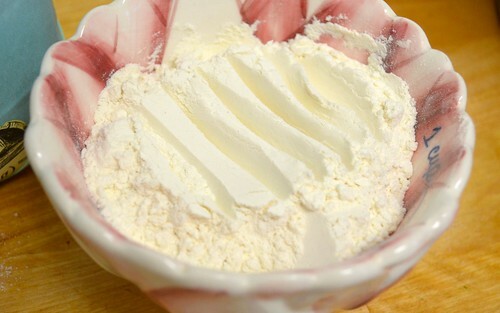 After an hour has passed, turn your (most likely very elastic) dough onto a well-floured counter. Divide in half and roll out each half into a mostly imperfect rectangle. 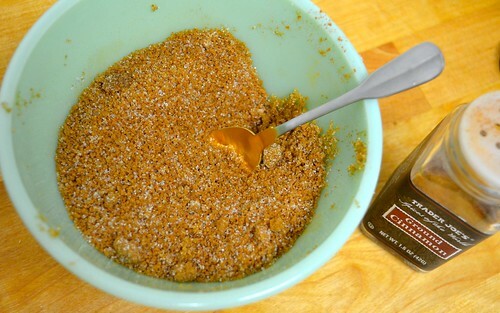 Quickly spread some of your room temperature vegan butter (or regular butter) onto your rectangle and then sprinkle with about half of your cinnamon-sugar mixture. 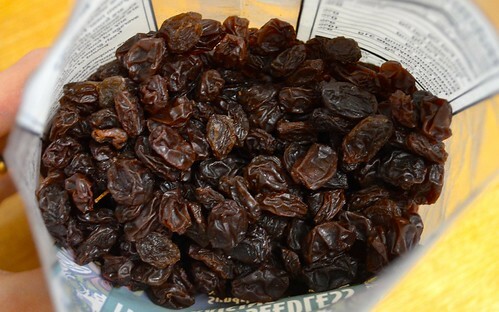 Then distribute 1/4 cup of your raisins over this half and roll up (carefully, making sure you don't squish all the raisins into one row). Gently stretch your roll until about double the size. Cut in half and set aside. Repeat with the second half of your dough, but be sure to reserve a tiny bit of your cinnamon-sugar for sprinkling on top of the loaf. Now comes the weaving part, which I've gotten a bit better at doing but no better at explaining. 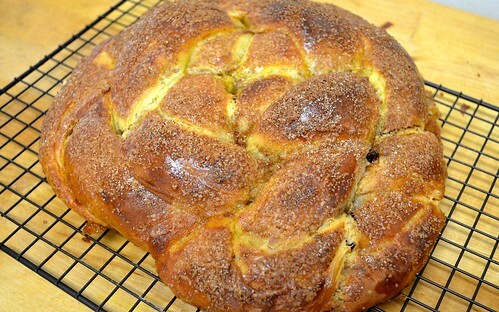 So here are some photos from the fig challah I made last week, and here are Deb's original instructions on weaving. 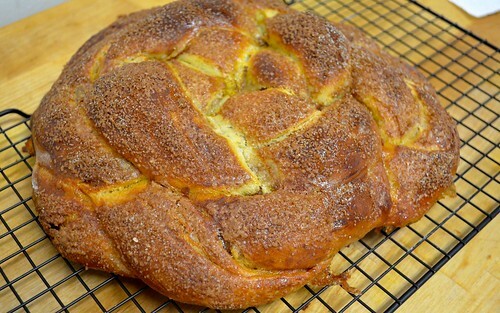 Of course, you could also weave it into the more traditional long loaf challah shape, which you can find here. Once you've woven into your shape of choice, transfer to a parchment paper lined baking sheet (or you could also bake on a traditional baking stone. Brush your loaf with your egg wash and set aside to rise for another hour. About 45 minutes into the final rise, preheat your oven to 375 degrees. If you're doing the oven-rising trick, make sure you remove the loaf before turning the oven on. Brush again with your egg wash, getting all the nooks and crannies, and sprinkle the loaf with the remainder of your cinnamon-sugar. 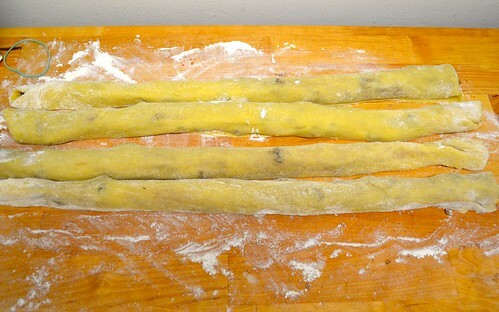 Bake for about 40 minutes or until an instant-read thermometer inserted in the center reads 195 degrees. Transfer to a cooling rack, which is a massive joke considering your kitchen and most likely entire home is now filled with the beautiful smell of cinnamon sugar eternal love. 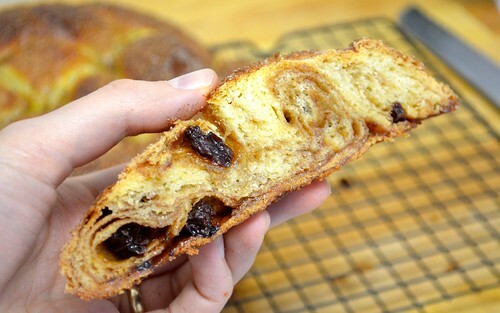 When you finally slice into this loaf, the cinnamon sugar filling will be slightly oozy and the raisins will have plumped up a bit during baking. 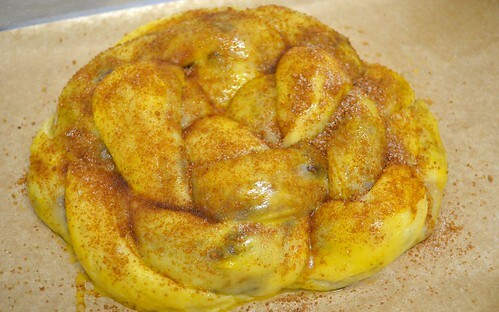 It's basically a massive cinnamon roll, the queen bee of cinnamon rolls, if you will. It would have made some to-die-for French toast, if only it had survived past day two, and making it to day two was a feat unto itself.